Both art and technology act as mirrors that reflect our selves and our relationship to the world. Both also create “quasi-others” – entities which we endow with subjectivity through the projection of ourselves. 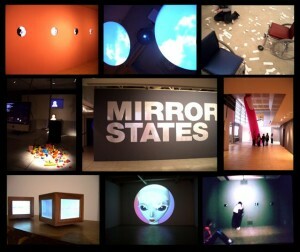 Mirror States draws together art and technology, combining these two powerful systems of reflection and projection. The exhibition presents digital and interactive artworks that offer arresting glimpses of the self and intriguing interactions with digital others. In Mirror States, some art works act as digital mirrors, enabling the audience to interact with magical reflections of themselves. These works make use of the seductive allure of the reflection, but go beyond narcissism into a realm where the self is creatively transformed. They explore aspects of contemporary identity, but also point to historical metaphors, myths and mechanisms for understanding our subjectivity. Other art works act like Alice in Wonderland’s magical looking glass, taking audiences into a digital realm where they come face to face not only with transformed selves but also with digital entities and simulated personas. Computer technologies allow artworks to ‘come to life’, demonstrating life-like behaviours and sophisticated modes of audience interaction. In these encounters with digital others the audience enters into a new participatory relationship with the artwork. These can be magical moments or uncanny and disturbing confrontations depending on the style and mode of the interaction. Together, the artworks in Mirror States point to new ways of exploring and understanding our own subjectivity and relationship with ourselves as well as our increasingly important relationships with technology. The exhibition brings together some of the leading artists working in digital media in Australia and New Zealand and demonstrates the strength and diversity of contemporary digital art practice in Australasia. Into this Australasian line-up we have invited Canadian artist David Rokeby, whose artworks and writing have been an inspiration for this exhibition, and an influence on many of the artists in the show. Exhibition Venues: MIC Toi Rerehiko, NZ, 16 May–5 July 2008; Campbelltown Arts Centre, Australia, 18 July–24 August 2008.